This would mean that certain conditions would have to be met to ensure that neither party brings files a lawsuit regarding the dispute. To ensure that neither party does this, both will need to sign a settlement agreement and this article is going to teach you how to make one. Think of this as a legally binding contract that’s meant to resolve any dispute between one party and another so that neither will have to go through the judicial process. When you’re making this kind of document, you must understand that it holds a certain power as it dictates how both will go about the dispute; basically telling them what they can and cannot do, as well as how compensation will be made. Which is why if you’re going to make this document, you have to be very careful with what you put in it. You may also see confidentiality settlement agreements. If you’re going to start making the agreement, then you’ll want to start it by tilting it in a way that informs the reader about what it’s all about. You may also see divorce agreement templates. Depending on the case, it may also require a caption or style of the case to be added. For example, let’s say that the case that’s trying to be settled is still a part of an ongoing litigation. It may need to include the names or identifiers of all plaintiffs, and there’s also the added chance that this information may change as the case progresses. 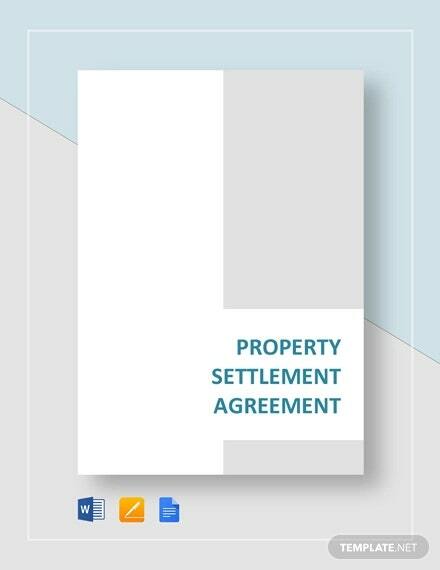 You may also see sample settlement agreement templates. When you’re going to make an agreement document, you’ll need to have a paragraph which introduces all of the parties that are involved in the matter as well as their roles. You want to make sure that the anyone who reads the document will easily be able to identify who is who, meaning that you are going to have to provide the complete names of the people that are involved. Also, you’ll want to write down their addresses and a state where the parties named have the capacity and authority to enter the agreement. You may also see release agreement templates. While writing the statement, you may also include that the parties named have the capacity to bind a company or entity, if this applies. A good example would be if the settlement agreement is between you and a small business. The agreement can state that the small business agrees to serve as the binder for its company. One o the most important sections of the document that the people involved will definitely need to go through is the one where the dispute is explained in a detailed manner. In it, one will know all about the “who”, “what”, “when”, “where”, and “how” aspects of the dispute. It is important to do this so both parties are in agreement about what specific act is being discussed in the agreement as well as what has to be settled. Because let’s say that one party sees that there are a couple of inconsistencies. Both will need to discuss the matter again to ensure that the description regarding the matter is nothing but the truth. You may also see release agreement templates. Without this provision, a court will have a tough time upholding and enforcing your settlement agreement in the event it is breached otherwise you’re going to have to get it approved. You may also see sample divorce agreement templates. Be as detailed as possible and include any information you may think is relevant to the situation at hand. This is the part of the agreement that will need to have the required consideration, which is necessary to spell out in order to have a valid contract. 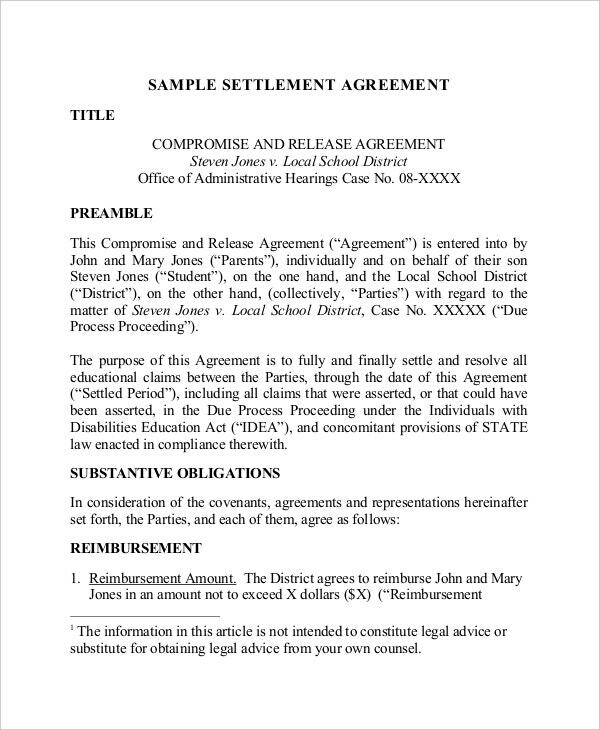 You may also see sample money agreement templates. The type of payments that can be contracted for are wide-ranging and can depend on the type of dispute that has to be settled. Compensation can come in the form of just about anything. The usual types would be through money, repairs, replacements, or even promises. The only thing that you have to make sure is that the form of compensation is nothing illegal, fraudulent or anything that involves criminal acts. You may also see written business agreements. When you are drafting this provision, be sure you are confident in the consideration you are receiving or giving up. 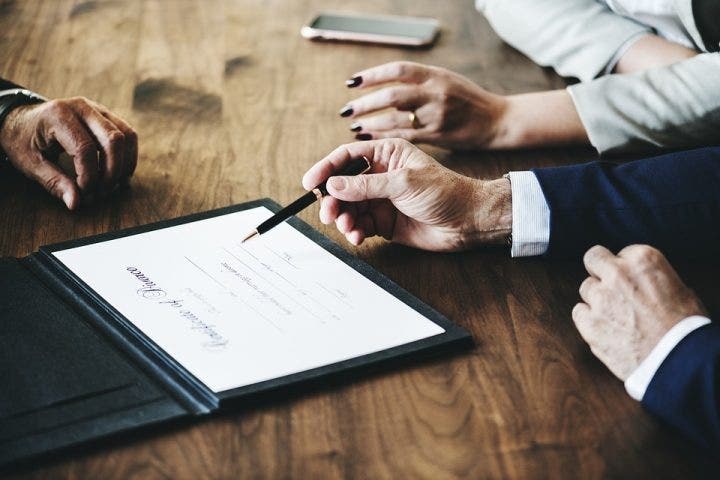 You must remember that a settlement is a legally binding contract, so whatever form of compensation is stated in the agreement will have to be committed until the agreement is over. If you’re the victim, you don’t want the compensation to be of a lesser value of whatever losses that have you have occurred. If you’re the person at fault, then you want to make sure you’re not overpaying the victim for what you have done. Just be sure that you go through the agreement so that you won’t be stuck giving or receiving compensation that’s unfair. During negotiations, you should have determined with the other party involved about whether the settlement agreement will be able to resolve all the claims, including unknown and future claims, or whether it will cover only a certain claim. It’s advisable that you have the agreement to take care of all claims, including unknown and future claims so that the two parties will no longer have any problems once the agreement is over and done with. 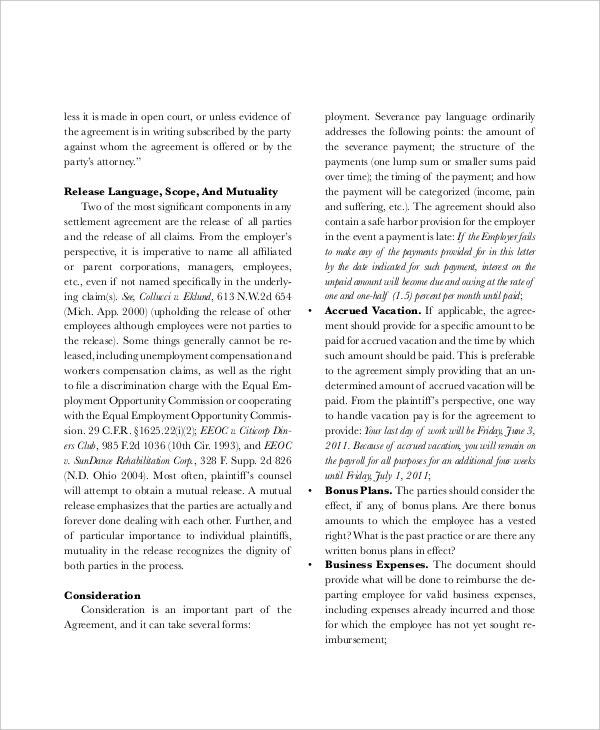 You may also see sample loan agreement templates. 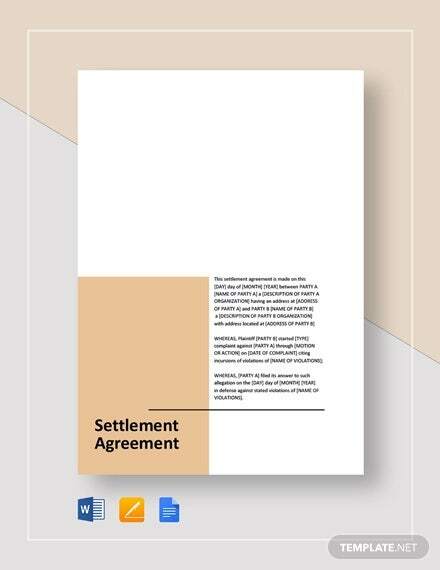 Not all settlements will resolve any and all claims arising from the dispute. This means that you are going to have to negotiate with the other party about the scope of what will be resolved, as well as how all other future claims will be dealt with. You may also see employment agreement templates. Sometimes, a conditional settlement agreement may be desirable. A good example would be if a certain matter had to be settled with a certain action, but that particular action will need to take time in order to complete. It is not usually desirable in situations where something may not be completed by a certain date, such as when a person has to keep the confidential information about a company in secret. In this case, you should negotiate an unconditional settlement agreement, wherein the effects would take place after a certain number of days. You may also see sample confidentiality agreements. 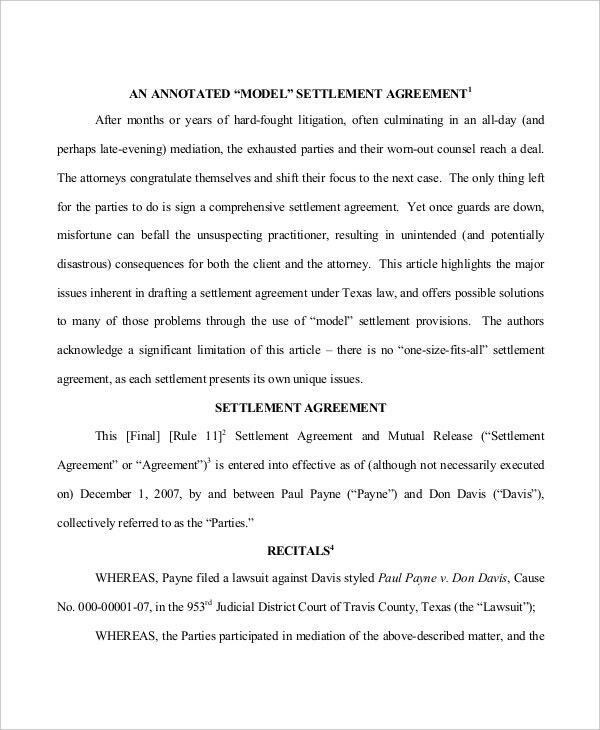 Oftentimes, when parties are agreeing to settle a dispute through a mutual agreement as opposed to going through the judicial process, the party that is providing the settlement payment might not want to admit to any faults or liabilities. If you and the other party have already discussed the matter and have come to an agreement, then you may provide a clause which states that the other party who is in the wrong to compensate without having to admit any wrongdoings. You may also see subcontractor agreement templates. Making your settlement agreement confidential ensures that neither party that’s involved is allowed to share any information regarding how the matter will be settled to anyone outside of the agreement. There will be times where one party would rather not have the information shared with anyone that isn’t involved, so having the option to keep the information confidential is a good way to get both parties to sign. This type of provision comes up most in business settlements where one company is often involved in litigation and settlement, and that it doesn’t want other potential litigants to know the usual terms of agreements. You may also see shareholder agreement templates. If you are in the middle of litigation when you decide to settle and create a settlement agreement, then it’ll be your responsibility to ensure that you include a provision where both parties have come to the conclusion that they will dismiss the litigation and not move forward with it. You may also see separation agreement templates. It is highly advisable to have your settlement agreement approved by the court. This constitutes a court order, and that makes it a lot easier to enforce the agreement rather than just having a simple contract. This is especially if you are not certain whether the other party will abide by the terms of your agreement. 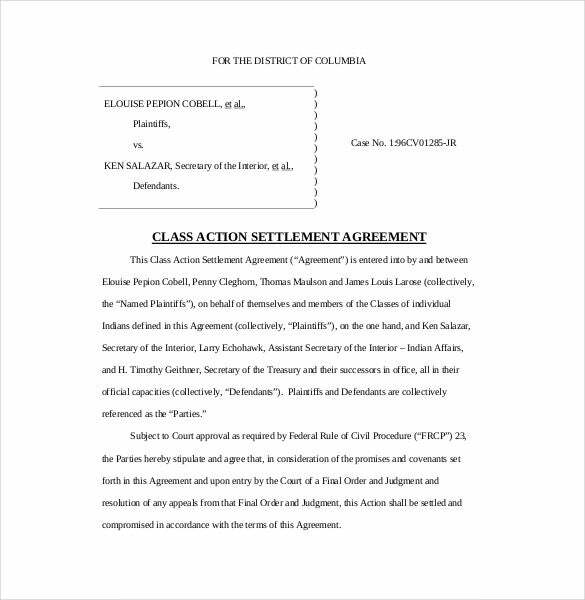 You should definitely hand over our settlement agreement to court to have it approved. 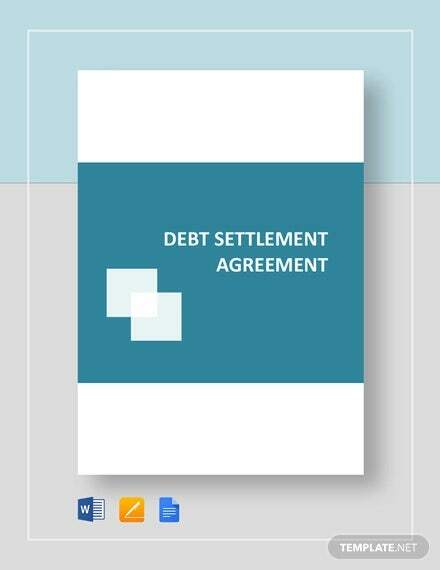 You may also see settlement statement examples. 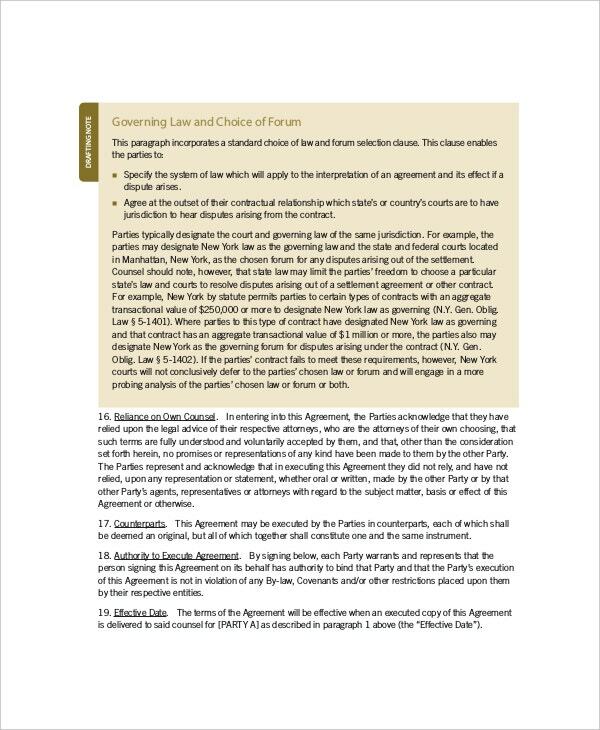 And lastly, you’ll want to be able to gain the signatures of the parties that are involved in the handling of the dispute. At the very end of the contract, you will make space for all parties to place their signatures in. Just make sure that they sign, their names are there, and that the date of when the agreement was signed to ensure that it’s official. You may also see sample agreement templates. If you would like to learn about other types of agreements that you can make, then all you have to do is go to our site. It has all the articles you need to help you with whatever situation you’re facing. Just be sure to read up whatever information is on there and that you utilize them well so that they can effectively help you out. You may also see confidentiality agreements in a word.